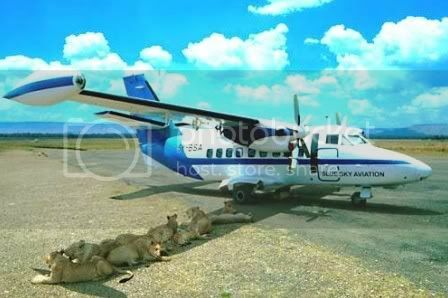 These photos of the lions sheltering under the plane have done the rounds over the years, but here is the story. Blue Sky Aviation Services is a 100% Kenyan owned private limited company. The company was founded in 1997 with a base at Mombasa's Moi International Airport. Mombasa has been the hub of Kenya's tourism trade ever since tourism started to flourish in East Africa. In 2001 Blue Sky Aviation spread its wings to Nairobi by setting up a base at Nairobi's Wilson Airport. Nairobi is the capital city of Kenya. Blue Sky Aviation operates Let 410 UVP-E series aircraft. These are twin engine, turbo prop aircraft with a 19-seat passenger configuration plus two pilots. Departing early each morning our flights are designed for maximum convenience to visit the ancient and Historical town of Lamu on the North Kenya Coast and also to the wonderful game parks of Amboseli, Masai Mara and Tsavo. There is a round the year demand for flights into the game parks from the coastal towns of Mombasa, Diani and Malindi. Approximately 60% of all tourist arrivals into Kenya land at Mombasa's Moi International Airport on board charter flights most of which originate from the United Kingdom, France, Germany, Italy, Switzerland, Belgium and Holland. Over the years the beach destination has been successfully laced with packaged air safaris to enable the tourist visit Kenya's world famous game parks in the shortest possible time and using the safest mode of travel. The most common destination for the air safari package is Masai Mara and hence, daily flights from Mombasa to Masai Mara. Blue Sky Aviation can boast of having the best performance record in its core business of flying tourists from the coast to the Maasai Mara. From its base at Wilson Airport Blue Sky Aviation regularly operates its 19-seater aircraft from Nairobi into various destinations such as Nanyuki, Samburu, Mara, Musoma, Kilimanjaro, etc. 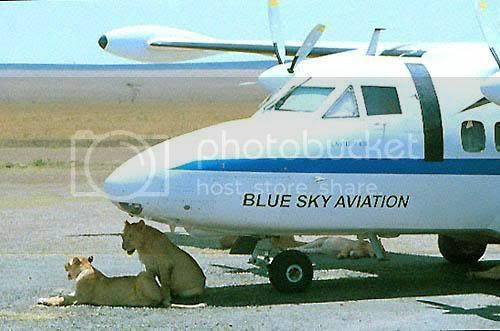 I guess that limits operations... aircraft being hijacked by lions all the time.